When my daughter was first born I used to wrap her like a mummy and she seemed utterly miserable. Little did I know that she hated having her arms wrapped down away from her head and I only discovered this when Tresillian taught me wrap with her arms up so that she could still access them. It turns out babies like to have access to their hands at all times – even in their sleep. For precisely this reason, the Love Me Baby swaddle is a great idea for babies who are similar to my own. They can still chew on their little digits, and you can be sure they won’t be able to wriggle out of the wrap. 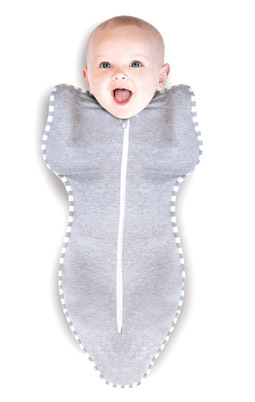 Available in grey, pink and blue, the Love Me Baby swaddle is available in sizes newborn up to 11kg and can be yours for $39.95 from The Hip Infant.